If you study the actual workings of the justice system over the course of our history, it becomes clear that it favors the rich over the poor, the white over the black, the orthodox over the radical. People who keep scorecards don’t really know what’s happening in the world. They have to work very hard to get people to go to war. They have to work very hard to get people to participate in the greed of a capitalist society. It’s in times of war that freedom of speech is most endangered, and is most repressed. And we’ve seen this: the sedition act was passed in the period of near-war with France in 1798. People were sent to jail for criticizing the government during The Civil War, or were sent to jail for criticizing the entrance into World War One. And, so on, down to the present day. If the world is destroyed, it will be a white-collar crime, done in a business-like way, by large numbers of individuals involved in a chain of actions, each one having a touch of innocence. I’ve come across Uncommon Sense – a book of quotes from the speeches and writings of Howard Zinn [amazon] – it is a fabulous “toilet tank book”, something you can read in those short pauses to contemplate. 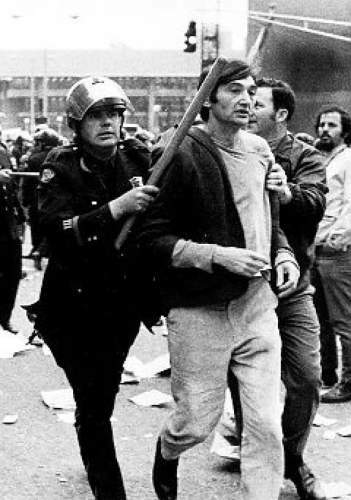 If you ever find yourself believing that America is or was ever great, you can cure it with a dose of Howard Zinn. It won’t take much, but sometimes it aches going down. If you don’t have any Zinn handy, you can substitute Chomsky.